From global news to the British economy, things can feel a bit bleak at the moment. While it’d be great to go into hiding with a glass of something strong and hibernate through it, unfortunately business – and life – doesn’t work that way. What we can do is celebrate when things are going well and keep an eye out to spot where the next upturn is going to be, to give us all a bit of a boost. One sector that’s flourishing is tech and we’re extra excited because we’ve had a record number of applicants to work at UKFast Campus too! Us UKFasters are pretty vocal about how much we love it here, but it’s always helpful to have some facts and figures to back it up. We’ve taken a look at our applicant numbers and are very pleased to say we’ve seen a fourfold increase to just over 5000 this year! The wider tech sector has been working its socks off too, outperforming all others in the UK in terms of job creation in recent years, and growing 32 per cent faster than the rest of the UK’s economy. Our CEO Lawrence is pretty excited about the trend, saying: “Brexit or no Brexit, people want to work in tech and for exciting tech businesses. It’s the fastest growing and most exciting industry in the world and Britain is one of the leading players. The sheer volume of applications that we’ve received this year is a massive increase on the same period last year, which shows that people are increasingly turning to the tech sector and making the most of the amazing opportunities it offers. Lawrence has his sights set on growing our team to 350 this year, having already gone from 200 in early 2015 to our current level of 300; a far cry from when he and his wife Gail began the business in a back bedroom 17 years ago! It’s not just a numbers game though; they mean nothing if you can’t keep standards across the board. Luckily we’re a growing company with a startup mentality, so we realise the importance of the personal touch. It sounds like it’s working too, as this year we year gained three star status – the highest possible – in The Sunday Times Best Companies To Work For list, placing 33rd in the Sunday Times Top 100 Best Small Companies to Work For. We also scooped the Employer of the Year Award at the North West Business Masters and came in 5th overall in the medium category of the UK’s Best Workplaces list 2016. Our growth means great things for our customers too; we’re recruiting the best talent there is out there, diversifying and growing new areas of the business to ensure we’re offering the best service possible. Our in-house recruitment team works tirelessly to make sure we get the right people into the right roles and our in-house training and education team are making sure that we’re continuously growing and qualified to the highest possible standard, which is why our NPS (customer satisfaction score) is consistently ten times the industry average. So, hopefully that’s a bit of good news for your Wednesday. 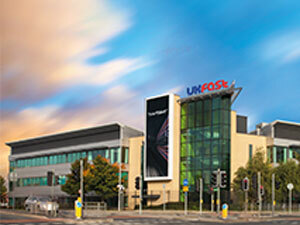 With the rise of digital there are plenty of opportunities for any business to get on board with tech and there are plenty of opportunities at UKFast too! If you want a bit of a boost, and to get in on a thriving industry, we’re looking for the next generation of UKFast superstars – apply now!